I was invited to tackle a take-home assignment for a UX Director position at NYC based Digital Agency. The assignment is designed to show how a candidate approaches and solves problems. It's based on an actual client assignment, but the name and city have been changed, for obvious reasons. I received the assignment on a Friday evening and had a scheduled appointment to present my work on Tuesday afternoon to the team. Thank you for agreeing to tackle this take-home assignment. This process will provide us with a glimpse into how you’d approach this type of project. We’re excited to see what you come up with!" 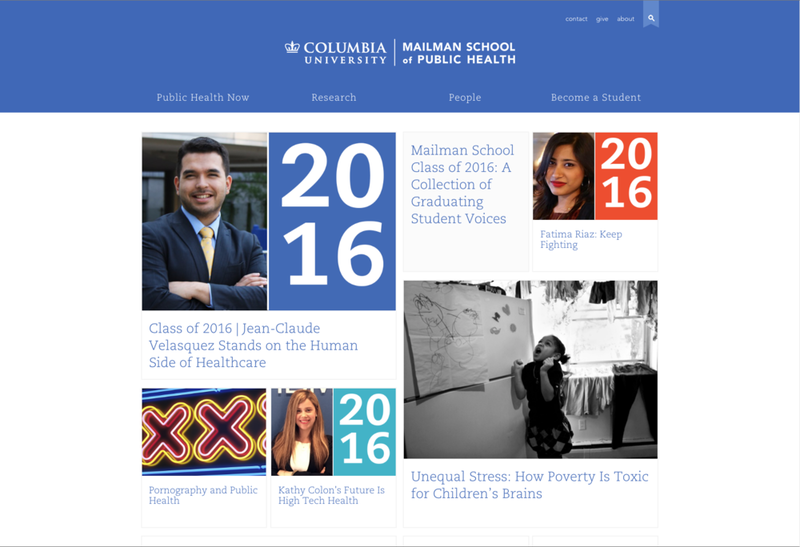 "We’re working with a prominent graduate school called Lemarr School of Public Health located in Washington, DC. The School is a global leader in the development of science, policy, and programs that improve health and prevent disease and disability. Addressing everything from chronic disease to health care policy, the School tackles today’s pressing public health issues by translating research results into action. Pretty important stuff!" 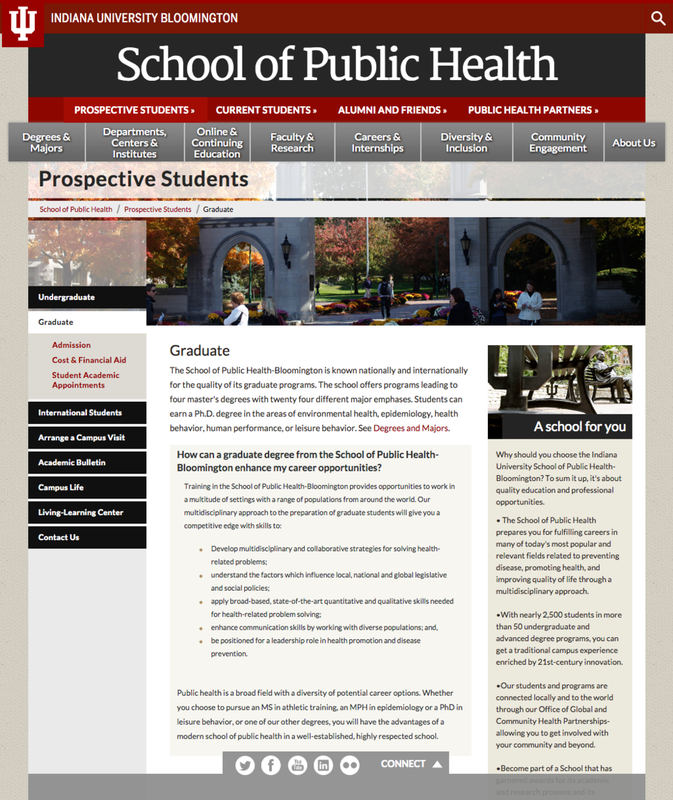 "Our primary audience includes prospective graduate students interested in a career in public health. 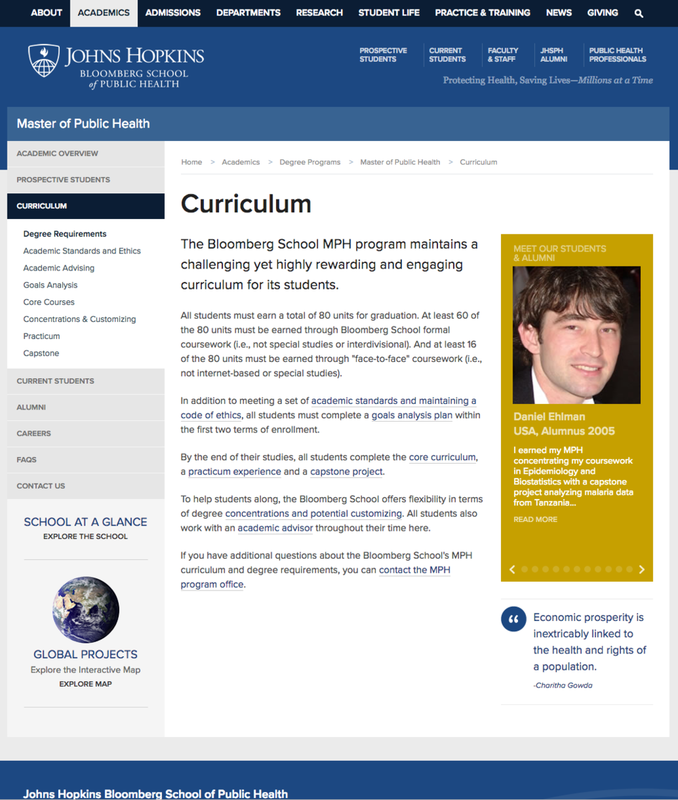 We know that prospective students already visit the site with the intention of enrolling, mostly due to the Lemarr School of Public Health’s great reputation. Unfortunately, the current site is so unattractive and disorganized that after visiting they often think twice about applying. An important secondary audience includes members of the general public interested in gaining access to the latest high-caliber public health information. Members of the public want to learn about the latest news, research, and progress in a specific field, but when they visit the site they’re unable to locate useful information on all the great work being done and progress being made." "First, craft a top-level navigation scheme that communicates how the Lemarr School of Public Health is on the pulse of public health today. The School spearheads incredible research that is positively changing the health of populations in its community and around the world, and the navigation structure should do a great job of telling this story. The navigation system should also include clear user pathways that make it easy for prospective students to get excited about the possibilities an education from a public health school provides. Next, include the navigation scheme you create in an engaging homepage wireframe. The existing site content is lacking, so you’re encouraged to dream up new types of content that tell the School’s story in a captivating way. Also, please include a short brief that explains your thought process behind creating these deliverables, as we’d love to learn a little more about how you approached this assignment." "Graduate students care deeply about the faculty who will be teaching them. Top-tier candidates often choose a specific graduate school so they can work side-by-side notable faculty members. Career path options for the field of public health are generally not well known. Because of this, students don’t understand what kind of future / career a degree from Lemarr could lead to. According to past research, “About” sections in the main navigation of university websites often get very little traffic. Users find very little value in them. After all, the entire site should be about the school, right? 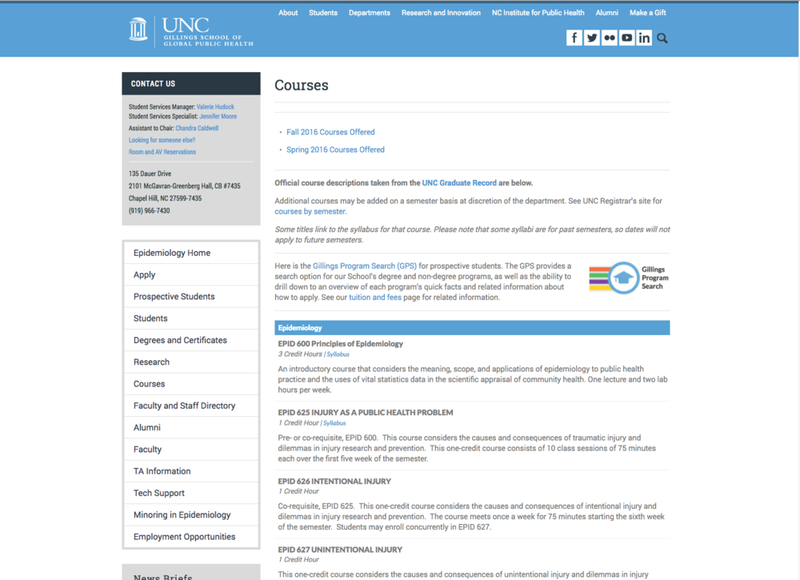 School websites often have similar top-level navigation items (Academics, Life on Campus, and so on). While this core content is often necessary, it’s important to give it a unique spin. Coming up with thoughtful (and appropriate) navigation labels can help shed light on what makes a school unique." A document that showed my process, (below) from research to analysis, decision making and design. A presentation on InVision that was essentially an executive summary of the process document. Thank you for giving me a chance to solve this take-home assignment. This document will show the process and approach I took to solve the challenge. I’m excited to see if we share similar thinking and hope I can bring something extra to the table." The purpose of this document is to show how I typically work on a problem like the one you gave me. When solving a big website design or redesign, I like to learn as much about the client, their business & customers as possible. I then try to immerse myself in the world of their target audience. The best way to do this is to talk to real people and get a sense of their hopes, dreams, and desires. Then I can tell compelling stories, use the right language and ultimately sell our client’s product to that audience. What I did instead was research as much as possible online to find proxies. I started with a competitive assessment to see who, if anyone, had a great website. 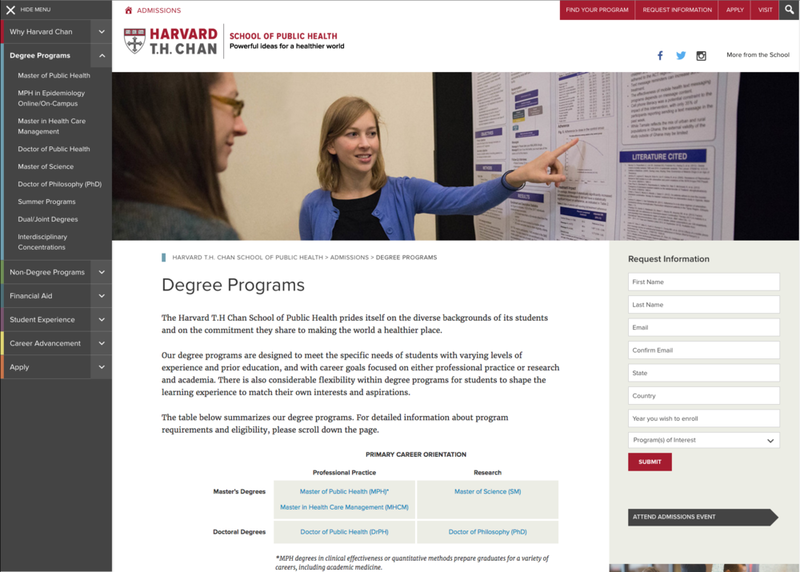 The assessment allowed me to do a deep dive into the world of Public Health graduate programs and find a pattern for the prospective students user journey. The assessment also gave me a chance to find a client that best matches the brief. I chose Harvard T.H. Chan School of Public Health to redesign. My criteria was simply a School, in a metropolitan area, whose website was in serious need of a redesign. I created a sitemap of the entire site, so I could understand the content, find patterns and hopefully a better way to organize it. This exercise could have been risky, because of the limited time to do the assignment, but I felt it was important, and there isn’t better way to find those hidden gems of content that could be up to a more prominent area of the site. I wanted to know what the goals, concerns and motivations of the user were. 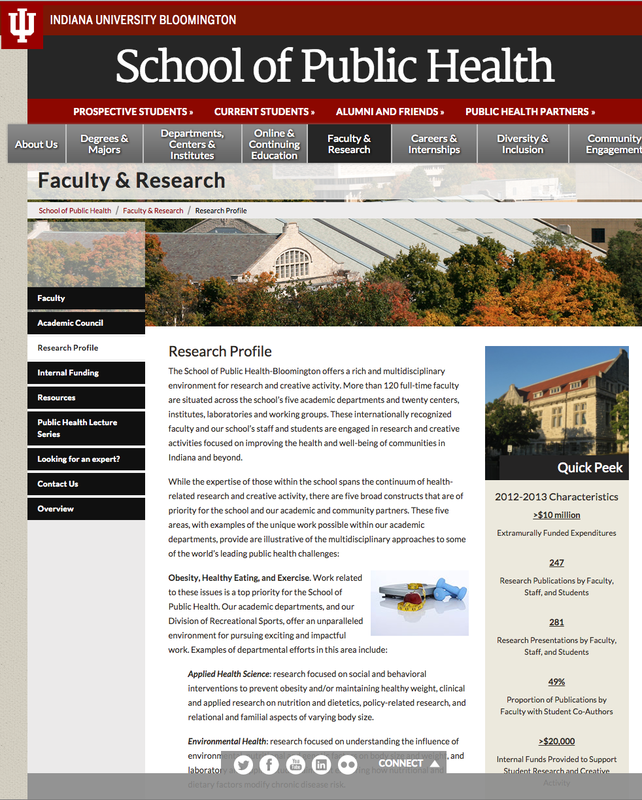 Finding profiles of students, faculty and alumni online proved to be easier than expected. What I learned was the pursuit of higher learning in public health is based on professional or personal experiences that move one to transform their career from treatment to prevention. I used this information to form my design decisions for the navigation scheme and the homepage wireframe. I thought it would be a nice touch to use a template that matched the brief, my apologies if I broke some brand guidelines in my attempt. I chose several sites to compare how they organize and prioritize content and navigation. 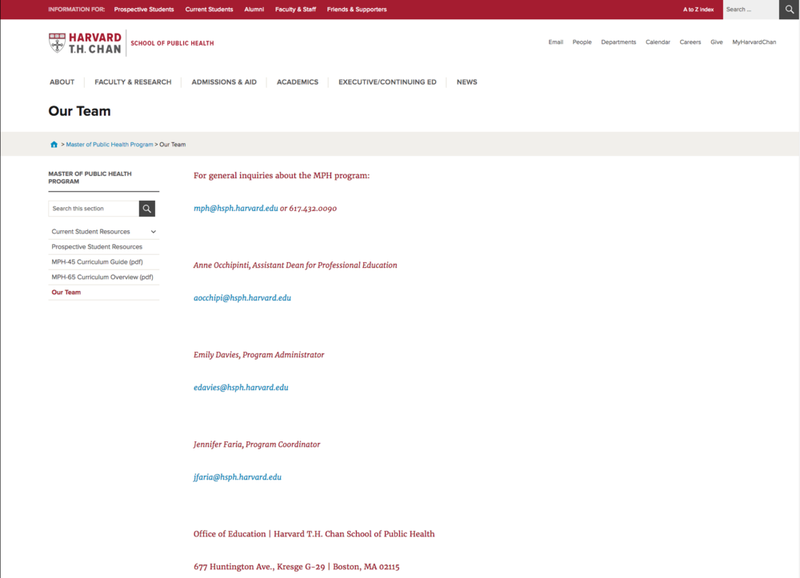 My first choice was based on a general search for graduate schools, “any school of public health.” The result I chose was Indiana University Bloomington. I reconsidered my search criteria when I realized the School wouldn’t be a real competitor of Lamarr. ...Etc. A total list of 44 schools. I wanted to find an existing website that matched the brief; a prominent School of Public Health, with an excellent reputation, in a metropolitan area, that has a poorly designed web experience. I was hoping to work with real content. I then captured screenshots of the journey as I learn what a typical user experience is, and what sites do it well according to my assumptions and hypothesis. I looked for patterns to determine what works. Skip to the last page in the section for my quick notes on each site. The site design is dark, feels dated and unsophisticated, the information design is complicated and overwhelming. I had a difficult time finding information and wasn’t excited by the content. I reconsidered my search criteria to look for a more realistic competitor. Finding the information I was looking for was easy. The user experience is very logical, and all the information you need is there. The visual design is appealing and felt very contemporary. Overall, a very goal-oriented user experience. It seemed like there was a half-hearted attempt at providing more emotional/inspirational content, but there was very little of it, and it usually appeared in a sidebar. I arrived on the site by clicking on a deep-link from Google and was immediately overwhelmed by all the navigation, so much navigation. Clicking around on the site to find information was confusing. Navigation items with different labels linked to the same pages. Items that were in shared navigation led to different sites. There was a lot of cross referencing between current student content and prospective student content. The visual design is cluttered with many competing elements. After you leave the main page, a “Request Information” form appears on every page. The photography on the site is of inconsistent quality, with some photos being of distractingly bad quality. Starting over from the School’s homepage helped with way-finding, but only a little. Very straight forward, relatively easy to use, and very boring. Wow! Just wow. You guys nailed it. So, this assignment just got a lot harder. What are the primary goals, concerns and motivations of the user? What criteria do they use when choosing a graduate program? What criteria do they use when choosing a school? If faculty members are an important factor, how do they know or hear about them? What different types of users are there for this school/program? In one sentence, what is public health to you? What inspired you to study to public health? What has been the single most rewarding experience of your career/studies so far? What is the one piece of advice you wish someone had given you when you were starting out in public health? What do you think is the biggest challenge that the public health field should be focusing on? “What inspired me to study public health is the multifaceted approach involved in solving health problems in a community. As an undergraduate I studied environmental science and had a strong interest in promoting healthy living environments for the underprivileged. 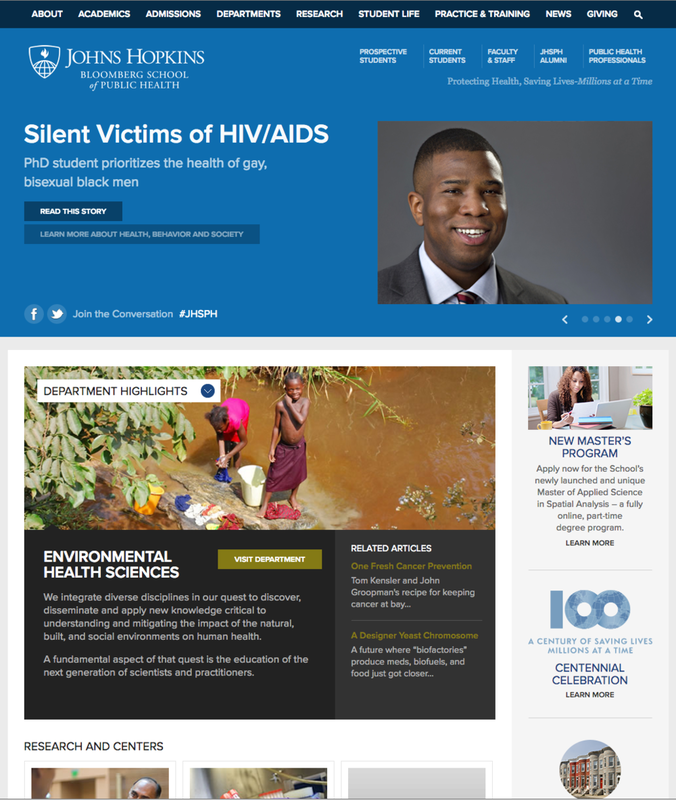 As a student in public health I am learning the potential of environmental health to help the most vulnerable; this is what motivates me every step of the way." “A passion for understanding the experiences of people living with chronic illnesses inspired me to study public health. Diabetes is a special area of interest for me. It impacts the well-being of individuals and populations and thus is a significant public health concern." “What I found attractive about being an environmental scientist or geologist as an undergraduate, was not at all diminished in my pursuit of a public health career. Instead these interests and expertise continue to play an important role in how I approach an environmental health issue. As an environmental health scientist, I am both environmental scientist and public health practitioner." The pursuit of higher learning in public health is about passion for change. Based on professional or personal experiences that move one to transform their career from treatment to prevention. I needed to find a proxy for Lemarr School of Public Health — a prominent School of Public Health, with an excellent reputation, that is in a metropolitan area & that has a poorly designed web experience. During my competitive assessment the Harvard T.H. Chan School Of Public Health seemed like a good candidate. I wanted to solve the problem with real content. I started documenting the site with a site map. This exercise appeared to be relatively simple as there wasn’t very much content. I was mistaken. The site is huge and terribly confusing to navigate. I did find a lot of broadcast quality videos that were either very compelling or inspirational. This content wasn’t featured on the “Admissions” area of the site, nor was it easy to navigate to. There are also several podcast series that have a Public Radio style reporting and storytelling feel to them. Most of this content was not only appropriate to show how amazing the work is that’s being done at the School, but one video series, “Why Public Health” was created for prospective students. 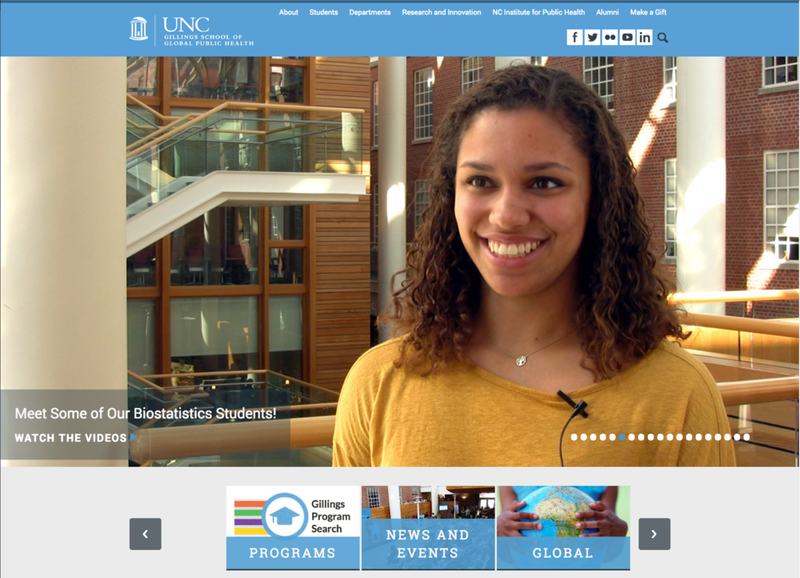 The videos don’t appear on the home page, and only one video is promoted but at the bottom of one of the pages deep in the “Admissions” area of the site. The content on the site is quite good, inspiring even. The School seems like the most perfect and challenging place to get your degree. With top-notch faculty, facilities and a wonderful environment. The best of the best, except for the website design. You can see the sitemap as a work in progress at LucidChart. This categorization is essentially the Columbia navigation. I tried to imagine what could be the opportunities to tweak and adapt the sections for Harvard. ...And, then played with the labels.